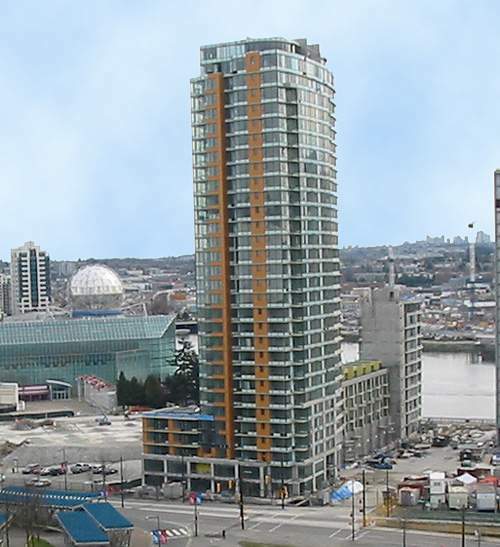 Coopers Lookout at 33 Smithe Street, Vancouver, is the second of five waterfront buildings that make up Coopers Landing, situated east of the Cambie Street Bridge and across the water from the 2010 Olympic Village. Interiors all suites have balconies, contemporary low-pile carpeting, stainless steel appliances, oak parquet floor upgrade. TV and phone jack in all rooms. The Bathrooms feature stone vanity with full length mirror, porcelain walls and floors, full size soaker tub and shower combination, vessel sink with single lever faucet.